I’ve written in the past my contemplations around whether you have to read every single short story in a short story collection in order to have “read the book” and I wonder if there’s a percentage, like at least 60 per cent or something but it doesn’t really matter because I read every single word of this Doretta Lau collection and loved it, which only made me wonder what the hell took me so long to get around to reading it. But then she drops a Landy / Bannister reference that if I’d read back in 2014 when the book came out I probably never would have gotten and it only made me love it more. 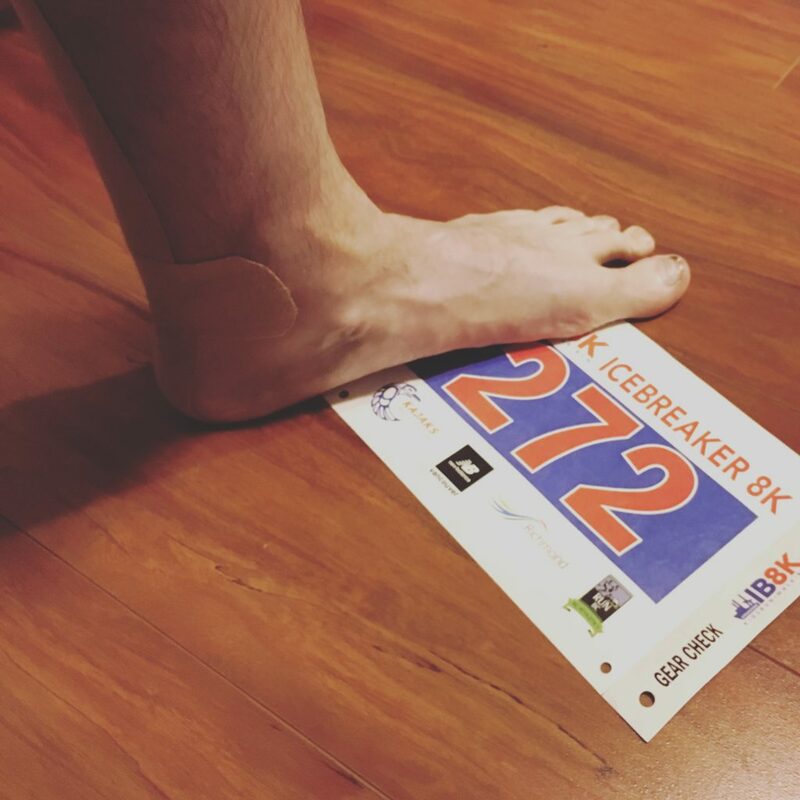 A taped up achilles to go with my first race bib of 2019. Today was the first race of the year and the first race of my 2019 goal to run one race per month. I took it pretty easy this week, only running an 8 KM trial from the Stanley Park Seawall marker 0 KM to 8 KM (clever) with a few kilometres warm up and jog home. Then Friday morning I went to my physiotherapy appointment to check on my aggravated achilles and was told that racing today was not recommended, that I should stick to no farther than 5 KM and no hills but more frequently but I sort of stopped listening after no Icebreaker 8K race. I had been researching cycle trainers and thought that with the news Friday I might as well set up my bicycle to pedal to nowhere so I bought a gently use CycleOps Fluid2 off Craigslist for a deal and I still have a lot to learn because of course it didn’t include the adapter not that it matters since my Specialized Diverge has thru-axel mounts and not quick-release so I found an adapter online and ordered it and it might arrive by next Monday. No, not tomorrow, the other next Monday. The race that I care about, the First Half, runs three weeks from today. I’m not going to get much training on my feet but I’m hoping that if I mix in some time on the bike this year’s race won’t be as disappointing as last year’s. I’ve all but written off setting a new personal best – that would take a miracle (of which there’s no such thing). I only hope that I’ll get to race. It’s been a depressing couple days.